The result of the Chartered Accountants (CA) Intermediate - Integrated Professional Competence Course (IPCC) Examination held in November, 2016 got published on Tuesday, the 31st January 2017. A huge number of students from Resonance Commerce and Law Program Division (CLPD) qualified in the IPCC examination. The Managing Director of Resonance, RK Verma Sir told that 174 students qualified from the three study centers located at Indore, Jaipur and Kota. Samyak Jain studying at Kota Study Centre along other 19 students qualified both the groups. Forty Six students qualified from Kota Study Centre. Out of the qualified students, 29 students qualified First Group, 16 students cleared the second group and one student cleared both the groups. 26 students qualified from Jaipur Study Center, out of which 17 cleared the first group and 5 cleared the second group. Sarvesh Kabra, Harshvardhan, Yash Gangwal and Naman Gupta cleared both the groups. 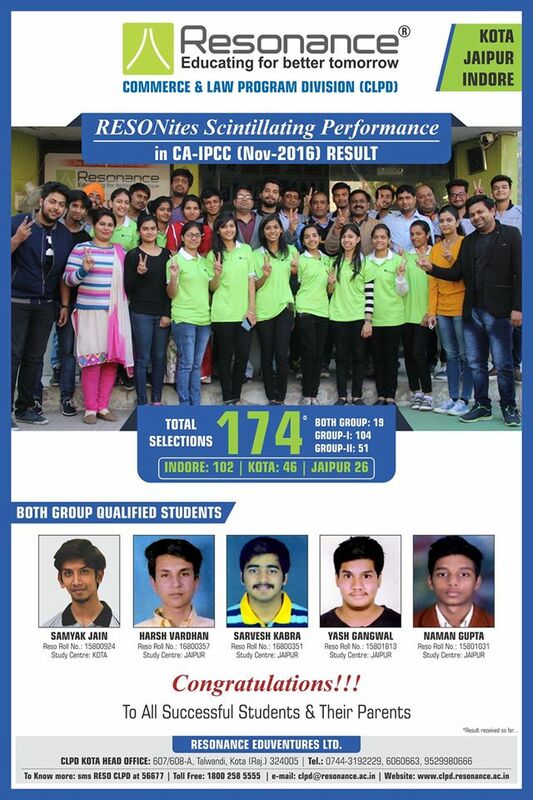 102 students from Indore Study Centre cleared IPCC. Out of the qualified students, 14 students cleared both the groups, 58 cleared the first group and remaining 30 cleared the second group.